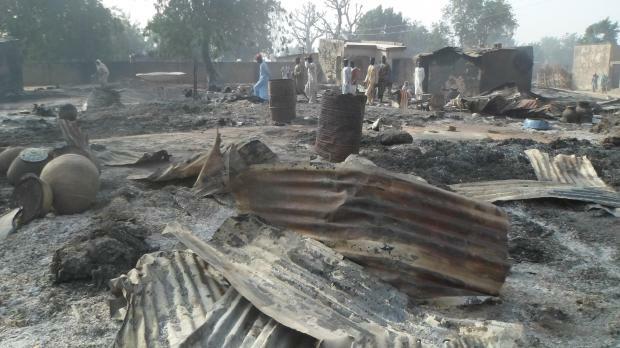 Boko Haram extremists have fire-bombed huts, burning people including children to death, in the latest attack by the Nigerian group, according to a survivor. Scores of charred bodies lay on the streets following Saturday night's attack on Dalori village, three miles from Maiduguri, the birthplace of Boko Haram and the biggest city in north-east Nigeria. The attack continued for four hours, survivor Alamin Bakura said, adding several members of his family were killed or wounded. The violence continued as three female suicide bombers detonated their devices among people who managed to flee to neighbouring Gamori village, killing many, according to a soldier at the scene. It was not known how many people were killed as bodies were still being collected, including from the surrounding bushes where the insurgents hunted down fleeing villagers, according to security guard Abba Shehus. Boko Haram has taken to attacking soft targets, increasingly with suicide bombers, since the military last year drove them out of towns and villages in north-eastern Nigeria. The six-year Islamic uprising has killed about 20,000 people and driven 2.5 million from their homes.